Sale - 29/02/2016. Our purchase ended up being a very long and drawn out affair but your staff were excellent. Andrew, Julie and Rebecca all dealt with the sale over the 6 month period and were always incredibly patient and efficient. I can’t thank them enough for getting it all moved along and for their help along the way. I would definitely use them in future. Altrincham - 20/01/2016. Excellent service from start to finish with the sale of our house. Understood our wishes and guided us throughout the whole process. Grateful thanks. Sale - 18/01/2016. We were pleased with the service we received. All our queries were dealt with swiftly. I thought Andrew in particular was switched on and professional throughout. I would recommend him to others. Alderley Edge - 18/01/2016. Lesley in the Alderley Edge office was particularly helpful and very efficient. We would not have purchased the property without her help. Cheadle - 18/01/2016. We found Mr Leighton Snow very professional and courteous and would have no hesitation in recommending him. Cheadle - 15/01/2016. Gemma was brilliant. Quite a difficult sale and purchase but dealt with everything brilliantly. Holmes Chapel - 15/01/2016. Excellent, professional service throughout and achieving a good result. Didsbury - 14/01/2016. The staff were always helpful and friendly and went out of their way to keep the sale progressing. They were incredibly calm dealing with difficult sellers and as I mentioned before they bent over backwards to ensure we made the exchange. James drove legal documents to the seller for a missed signature which enabled us to make our completion on 18th December. Very happy. Marple Bridge - 14/01/2016. We used Marple Bridge and the manager Richard Leece was extremely helpful and understanding. I would recommend this branch without hesitation. Stockton Heath & Lymm - 14/1/2016. I sold my property through the Stockton Heath office and every member of the team has been professional, friendly and helpful. They made a stressful time pleasurable!! I purchased through Lymm and same excellent service. Heaton Moor - 14/12/2015. Having been seriously let down by the incompetence of two other local agents we were very impressed by the friendly professionalism of Gascoigne Halman staff who went well beyond the call of duty to sell our property. Altrincham - 14/12/2015. Sinead Fitzgibbon was very professional, extremely helpful and focused. There were numerous issues with the purchase and Sinead was very helpful and responsive. Highly recommended. Bramhall Lettings - 14/12/2015. All the staff I spoke to over the ‘phone or in person were very friendly and professional. Very speedy replies to any queries or questions. Extremely pleased with everything!! Cheadle - 14/12/2015. Gemma was excellent and Katy too. Very open, efficient, personable – a cut above the usual “Estate Agent”. I really valued her approachable manner and found her much less anxiety provoking than our estate agent that we sold our property with. Thank you. Lymm - 10/12/2015. We got a viewing the same day we saw the property on line. This was crucial as we had to act quickly. The whole thing went through in 4 weeks. Well done to Tracy and Bobby at Lymm office. Macclesfield - 10/12/2015. I would like to express my appreciation to all staff, especially Carly who is an asset to your company and a great ambassador for your company. Well done. Holmes Chapel - 10/12/2015. I would like to make special praise of Sarah Lawrence at the Holmes Chapel office who has been great at keeping in contact and has done much to progress our sale. Marple Bridge - 10/12/2015. I viewed my property at the suggestion of Reid Macintyre, who had queried my previous choices. He had made the sale before I left. Attentive, never pushing and if I asked for info he did not have, he rang me very quickly afterwards. He negotiated in a straight forward manner which shortened the process. I was in difficult circumstances and all the staff did extra to assist me. Outstanding service. Wilmslow - 10/12/2015. Initially Markus Jolleys and then Lucy Kershaw were polite, helpful and entirely professional throughout the selling process. It was the most straightforward house sale I have experienced. Thanks! Wilmslow - 10/12/2015. Of all the estate agents we dealt with over the last 6 months your staff were by far the most friendly and professional. Well done! We would also like to thank in particular Lewis and Lucy who were both wonderful to deal with. Altrincham - 27/11/2015. Sinead dealt with my purchase. She was excellent in ensuring the viewing of the property I eventually bought after I had had difficulty organising a viewing previously. Holmes Chapel - 27/11/2015. We were always kept up to date with our purchase. Sarah was a star throughout the whole process. Thanks for everything. Cheadle - 27/11/2015. Very impressed with the level of professionalism. Would use again and was very pleased with Gemma. I just wanted to thank you and your team (on behalf of my parents too) for dealing with the sale of 19 Park Mount Drive which completed today. It's been a stressful time for the whole family and we were concerned about the property being on the market for too long whilst empty. However, we have been kept informed throughout the whole process with details of every viewing and your team has always responded quickly to any queries we had. Although we no longer live in Macclesfield we still own several investment properties, so we may be in touch again one day when we decide to sell them. Knutsford - 23/10/2015. Well done to Fay Ravenscroft!! She is fantastic! Marple Bridge - 23/10/2015. Very happy with service received, speed of sale and efficiency of staff. Heaton Moor - 23/10/2015. I was very impressed by the staff and the service provided. No complaints – everything was very satisfactory. Marple Bridge - 23/10/2015. Richard at Marple Bridge office was well informed and very helpful throughout. Stockton Heath Lettings - 23/10/2015. Richard Marks’ high standard performance is worth to be mentioned. Cheadle - 23/10/2015. I was very pleased with the service I received from the staff at the Cheadle office. Gemma in particular kept me well informed re the sale of the property and was always polite and friendly. Sale - 22/10/2015. Upon contact from the manager downwards all staff were fully aware of state of play concerning the sale of my property. All staff were willing to help. In particular I would single out Andrew, Dan, Annie and Julie as being very professional and helpful. Altrincham Lettings - 22/10/2015. Having dealt with a letting agent previously that was poor I found Gascoigne Halman very easy to deal with and a stress free experience. Alderley Edge - 12/10/2015. Excellent team, service and communication, especially Lesley. Thank you. Holmes Chapel - 12/10/2015. We were very impressed by everyone at the Holmes Chapel office throughout. Prestbury - 12/10/2015. The sale of my property was complicated (it included the sale of an adjoining property) and was managed by all the staff - very professional and friendly. Heaton Moor Lettings - 12/10/2015. Alison was lovely and really helpful. We appreciated the housewarming card. Macclesfield - 12/10/2015. I had two sales fall through before the third one completed and Carly and Adam were both superb at dealing with all aspects sympathetically and professionally. Thoroughly happy with Gascoigne Halman’s service throughout. Thank you. Altrincham - 12/10/2015. Tom Slater has been absolutely wonderful! I have not have asked for a nicer, more professional person to help me through this difficult purchase. Thank you Tom!! Prestbury - 9/10/2015. The staff at the Prestbury office were both helpful and friendly throughout the period of time that our property was for sale and being purchased. Alderley Edge - 9/10/2015. An impeccably professional, efficient, friendly and experienced personal service. Many thanks. Wilmslow - 9/10/2015. Lucy, Lewis and James were great to deal with, in what has been a very protracted purchase! Macclesfield - 30/9/2015. We were served by Angela at Macclesfield branch and had excellent service from her and she also was so pleasant to deal with as well as being efficient. Holmes Chapel - 30/9/2015. Steph and her team are extremely helpful with all the buying and lettings of the properties we have purchased. Will definitely be using them again. Hale - 30/9/2015. I felt I was looked after very well by the staff at Gascoigne Halman Hale. Always a welcome if I went in; they discussed property in the area in general; compared houses and facilities; lots of advice; “knew their stuff”. I would like to take this opportunity to thank you and your team for all the hard work and faultless service you gave in ensuring the sale of mum’s property. When it came to choosing an agent to sell mum’s home my greatest concern was finding an organisation which would recognise and understand our needs. In are case it was someone who understood that my mum is elderly and would need additional help and reassurance when explaining matters, completing forms etc and help finding a local solicitor who also understood our situation. All I can say is that Gascoignes especially Gemma surpassed my expectations and made the whole process a lot less stressful. Gemma is a real talent and a very good people person, a true professional, someone you can rely on and trust. I’m sure its only a matter of time before Gemma goes on to manage her own office. She did the extra when it was required to ensure the process remained on track even when matters were far from clear and the chain nearly collapsed. Once again, thank you so much for doing such a great job and wish you and your team all the success for the future you deserve. Wilmslow - 25/09/2015. Excellent service from Lucy and Lewis. Very professional and efficient. A credit to the Company. Whaley Bridge - 25/09/2015. We would never have seen the property if it hadn’t been for the estate lady who, when I rang to book a viewing at the house next door, suggested I looked at this one too! My daughter was buying a house at the same time as us and she had weekly updates from her estate agent. Genius idea! Altrincham - 25/09/2015. The house was bought from GH in 2005 and the service was good. Many thanks to Sinead, Adam, Tom and the team for an excellent and professional service and for keeping us well informed throughout the process. Would certainly recommend to others! Cheadle - 25/9/2015. Gemma Lumby was extremely pro-active in helping speed up a buyer who was awkward; she put our minds at ease and we felt we could trust her completely. We are extremely grateful for her care and attention along with Katy. Thank you. Holmes Chapel - 24/09/2015. Excellent personal attention from Steph Leech. Thank you. Bramhall Lettings - 04/09/2015. I represent HCR Relocation. We rent properties nationwide for local and central government. Moharram Rehman is exemplary in every way she dealt with us. Sale Lettings - 04/09/2015. Hannah from lettings in Sale branch helped me move into area without any hassle. Knutsford - 04/09/2015. Highly professional at all times. Thank you to all staff at Knutsford (especially Fay). Prestbury - 04/09/2015. Staff at the Prestbury office were efficient, friendly and very professional. It felt very much like a personal service. Macclesfield - 04/09/2015. Can’t thank Carly enough. She worked very hard to make the purchase of our first home run smoothly and efficiently. Stockton Heath Lettings - 04/09/2015. Richard was extremely helpful answering all questions and was very professional. An absolute pleasure and credit to your customer service team. Sale - 04/09/2015. Gaynor was extremely helpful and knowledgeable. She guided us through the details of the vendor’s sales requirements with great efficiency. 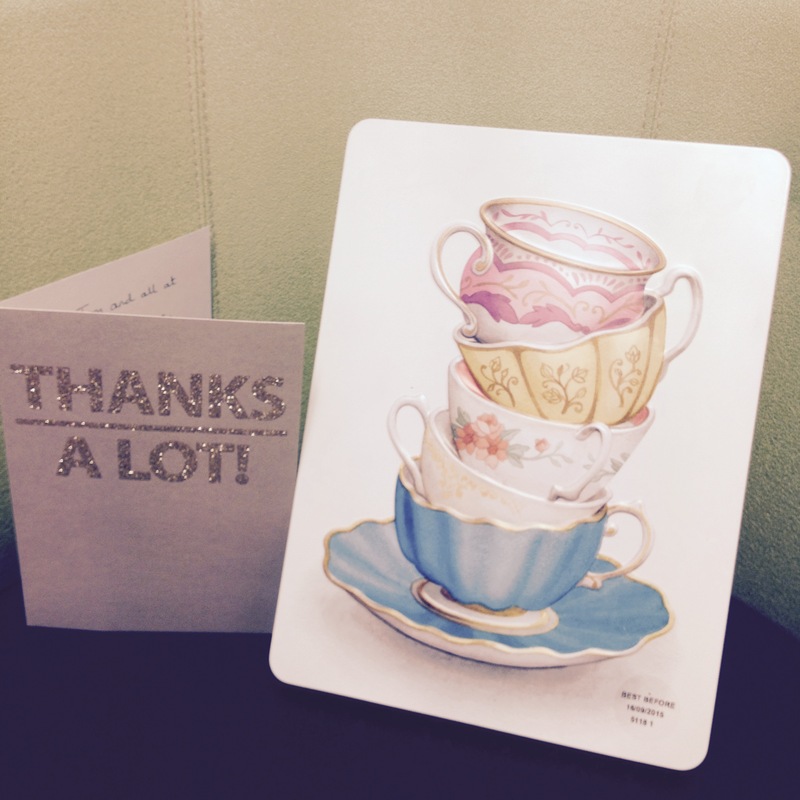 A very nice letter we received from a client. Hale - 25/8/2015. Jackie, Sandra, Phillip, Judy and the rest of the team. Many thanks for all the hard work put in by you all that resulted in the sale of our house. You have all been so helpful, resourceful and always with a friendly smile. It was a long road, but we got there in the end. Jackie, in particular, you did an amazing job, matching our buyers to the house. Fab job! Heaton Moor - 11/08/2015. Jamie and Amy very helpful. Made the process much easier. Always replied and returned calls. Very friendly. Marple Bridge - 10/8/2015. Richard Leece. Found him very good indeed. Helpful and professional. Whaley Bridge - 10/8/2015. I was impressed by the patience and understanding of Gascoigne Halman staff as my purchase of my new property was somewhat protracted due to the lackadaisical attitude of the buyers of my old property. Gascoigne Halman staff were very professional and courteous at all times and liaised closely with vendor to see my purchase through. Altrincham - 10/08/2015. Sinead Fitzgibbon went out of her way to be so helpful. She was there for me with all the setbacks I had. I cannot thank her enough for her support. Wilmslow Lettings - 10/8/2015. We are seriously impressed with how organised everyone has been setting us up. You made sure everything was sorted in advance – excellent. Very comprehensive inventory – great! Loved the help from Katie and Rachel at Wilmslow especially. Hope it continues. Thanks. Bramhall - 22/7/2015. Abi from Bramhall conducted herself brilliantly at the valuation and convinced us Gascoigne Halman were the best agent to market our home. I can’t thank Abi enough for her perseverance, professionalism and knowledge. During a very challenging period she kept calm and ensured the chain stayed on track. She went above and beyond to help with our sale and purchase and is an absolute star! Wilmslow Lettings - 22/7/2015. Excellent job! Especially Rachel Egar and Kevin. Holmes Chapel - 22/7/2015. We received excellent, friendly service at all times. Both Stephanie Leech and Sarah Lawrence were excellent, helpful, friendly and knowledgeable. We would definitely use Gascoigne Halman Holmes Chapel again. Sale - 22/7/2015. All the staff I dealt with at Sale branch (Andrew, Dan, Julie and Annie) were always helpful and kept me up to date with how things were progressing. Good service from them all and very professional. Whaley Bridge - 22/7/2015. I found the staff at Whaley Bridge worked as a well oiled team. Everyone was friendly and helpful and also very professional. Their knowledge of the area and their people skills helped the sale of my property to go through easily and quickly. Lymm - 22/7/2015. The staff in the Lymm office were really helpful and informative. We are delighted with the way our purchase was managed. Cheadle - 22/7/2015. I wish to sincerely thank Gemma and Katy for their assistance. Excellent service. Holmes Chapel - 22/7/2015. We want to say thank you to Sarah. She gave us the faith. Wilmslow - 22/7/2015. Great team, genuine, don’t play games but provide clear, concise information. Having a negotiating team took the pressure of me having to face that prospect. Excellent. Thanks Guys! Macclesfield Lettings - 22/07/2015. Lisa and Amanda were extremely efficient and helpful. We are pleased we moved from another agent. Knutsford Lettings - 22/7/2015. In particular Chris and Adam at Knutsford were extremely helpful, friendly and professional. I would always look to rent a Gascoigne Halman property over other agencies. Altrincham - 22/7/2015. Sinéad Fitzgibbon was the agent dealing with our purchase. We were extremely happy with everything she did for us. Wilmslow - 22/7/2015. I was delighted with the service I received and the successful sale of my property in only four days. Prestbury - 22/7/2015. It was a pleasure to deal with Jane. She was pro-active, efficient and professional. Sale - 16/6/2015. Used Gascoigne Halman to sell previous property and to rent last property. Felt very comfortable with staff and trusted that they would not let me down. Especially Dan in initial negotiations and Julie later on. Altrincham - 16/6/2015. We cannot fault the service we received by Gascoigne Halman. All staff we dealt with were polite and always happy to help. We were particularly looked after by Sinead Fitzgibbon who was extremely helpful throughout this whole process – thank you!! Stockton Heath - 16/6/2015. Friends we've known for thirty years had been delighted with every aspect of their dealings with this agent. Chris arrived promptly, smartly turned out, courteous and with excellent listening skills. Of the three agents we invited to visit the property, we were impressed by the speed with which Chris grasped our situation and needs and carefully explained and illustrated her proposed strategy. Her valuation seemed entirely realistic and she had prepared extremely well for our meeting, illustrating her points with the most recent sales in the same location, which she had to hand. The advice Chris gave, in our case, was to offer the property for sale at auction. We had no experience of this but had every confidence in her judgement. The publicity material was superbly produced and the viewings were well organised. We were kept fully informed at every stage. The auction was held in a well presented and well organised room in a very accessible hotel. Four other properties were sold at the same auction. The auctioneer worked well and the successful bid was extremely satisfying. We believe that the buyer has obtained excellent value and that we have the best price. We saw that the buyer was well looked after and her interests were well managed by Chris as we moved towards completion. Like our friends before us, we were utterly delighted with the agent's handling of the sale and felt that Chris and the hard working team at the Stockton Heath office had treated us as valued customers throughout. Buying or selling, we would both recommend this agent to anyone and use their services ourselves. Well done Chris and thank you. Prestbury - 12/06/2015. Jane Andrew showed excellent professional approach in progressing to contract exchange. Poynton - 12/06/2015. We decided to use Gascoigne after our initial enquiry which we felt was handled in a much warmer way than the others, from that point forward Joanne was exceptional, not just in communication and keeping us informed, but she also had to deal with a difficult relationship between the existing joint property owners and their individual expectations. I'd like to thank Joanne and all the staff at the Poynton office for all their help, I couldn't recommend you enough and I hope my review helps others make the right choice when they come to sell their property. Macclesfield - 12/06/2015. Carly and the team have been great. Always passed on messages, returned calls and acted fast to resolve any problems/queries we had. Thank you for making buying our first home less stressful!! Poynton - 12/06/2015. 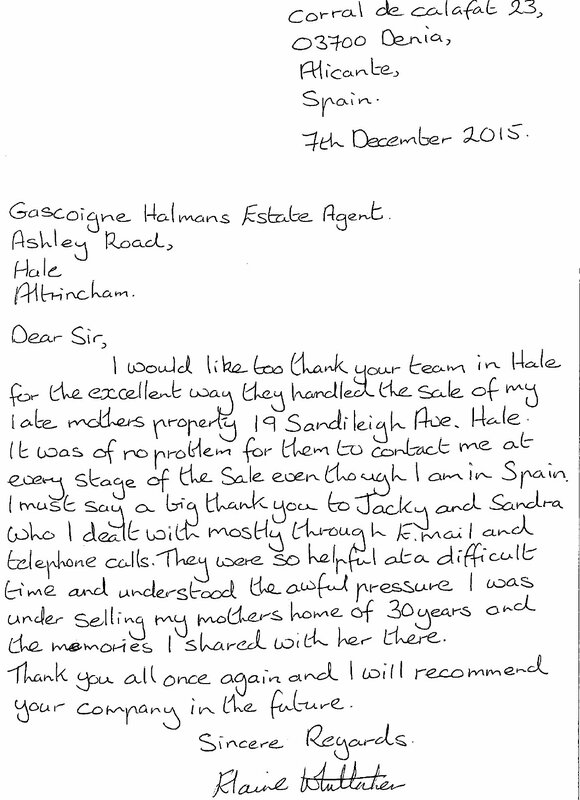 I would definitely recommend Gascoigne Halman in Poynton if you are thinking of selling your house. Dan is an excellent manager who has excellent knowledge of the area, and was extremely helpful with viewings he got good constructive feedback that helped us move forward with our sale and helped us to secure a good offer. Joanne was amazing our sale wasn't without hiccups ,Joanne kept us informed through out and was often chasing the chain for the solicitors, the rest of the team are extremely helpful and were great at doing the viewings . I have had an extremely positive experience in a very stressful house move, I wouldn't hesitate to recommend them. Bramhall - 12/06/2015. Matthew and Abi have been outstanding in the service they have provided to me. Sale Lettings - 27/05/2015. Very friendly and helpful staff. Dealt with Sarah, Hannah and Kate. Stockton Heath - 27/05/2015. I would particularly like to thank Lee Tickle and Karen McDonough who were fantastic throughout the sale. They kept me sane when negotiations became very stressful. Alderley Edge - 22/05/2015. Excellent service from start to finish. Would definitely go with Gascoigne Halman’s Alderley Edge office again. Marple Bridge - 22/5/2015. Excellent communication throughout a traumatic period of months – a chain which was very slow. Sympathetic and proactive! Altrincham - 22/5/2015. Gascoigne Halman is well known in the area and Adam suggested the “open day” which we liked. Tom in the Altrincham office has been great. GH put our house on market very quickly. Both Sinead and Tom were very professional all the way through. Heaton Moor Lettings - 22/5/2015. Every time I rang or went into the office all staff were very friendly and very helpful especially as this is my first time renting. They were very reassuring. Stockton Heath - 22/5/2015. Excellent through the process. I wish I had more houses to sell as I have fallen a little bit in love with Christine Rees. She is amazing! Christine made everyone feel at ease with her calm, confident nature. She is understanding and very committed to getting things done. We trusted her completely and will greatly miss her winning smile and humour in a stressful situation. She is by far the best estate agent we have ever dealt with in 11 moves and would never use anyone else. I wish we could bottle her and get her out when we need a pick me up!!! Cheadle - 22/05/2015. 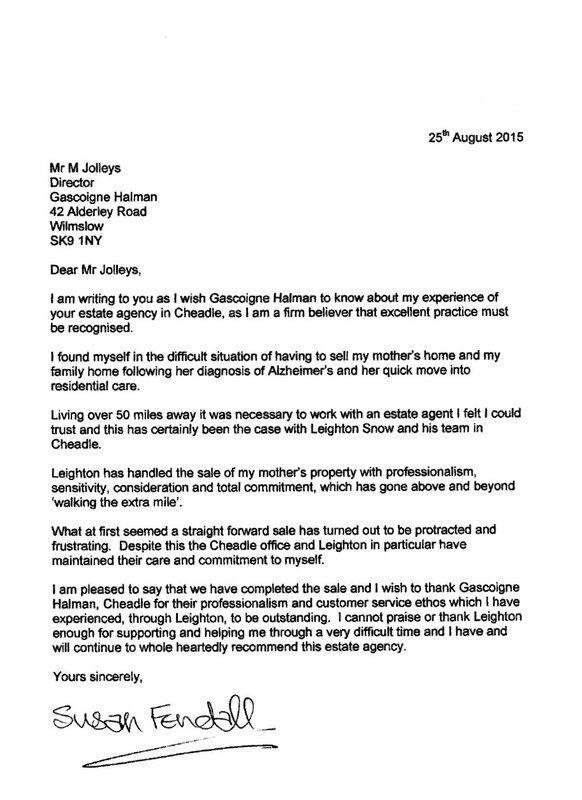 Excellent service provided by Gascoigne Halman Cheadle. Professional, knowledgeable and friendly staff team. Prompt communication throughout the sale process. “A faultless service all round”. We would have no hesitation in recommending your service to others. Excellent work Leighton, Katy and Gemma! Thank you. Wilmslow Lettings - 22/05/2015. Rachel. I've been meaning to get in touch for a while to express my gratitude for the service you provided us prior to and during the early days of our tenancy. You were a pleasure to communicate from Australia with and a credit to GH. Thank you. Altrincham - 11/05/2015. Courteous and efficient sums up Adam and the team at Altrincham sales office. Holmes Chapel - 08/05/2015. Stephanie and her team have acted with professionalism and friendliness throughout the sale process and I would have no hesitation in recommending them to other sellers. Bramhall - 08/05/2015. The staff at Bramhall were first rate. Delivered everything as promised and gave excellent advice. Wilmslow - 08/05/2015. All the staff at the Wilmslow office were friendly, efficient and professional. We were well looked after by all but particular mention to Lewis and Lucy for their support and efforts to secure a smooth sale and purchase for us. Thank you. Knutsford - 08/05/2015. Andrew Rogers and Fay were excellent and have made this whole process very painless. Updates on the proceedings were great and kept us all informed. Lymm - 08/05/2015. Bobby, Tracy, Paula and the team have been fantastic from start to finish. We would definitely recommend this estate agent to friends and family and will use again in the future! Altrincham Lettings - 1/05/2015. We were extremely happy how quickly our property was let and the service we received. Well done Harvey, Joy and Linda. Wilmslow - 01/05/2015. Despite the fact that the first purchaser withdrew without reason a second buyer was found within a week – in fact 2-3 buyers. There were a few problems outside Gascoigne Halman’s control, but these were dealt with very effectively. Thank you to Markus, Lucy, Sandra, Lewis, James et al. Stockton Heath Lettings - 1/05/2015. I was extremely impressed with Andrew and Richard. They are both absolutely outstanding and an incredible asset to Gascoigne Halman. Knutsford - 20/04/2015. I should just like to give special acknowledgement o Fay in the Knutsford office for her friendliness, professionalism, help, enthusiasm and support. She is a great asset to your organisation. Cheadle - 20/04/2015. Many thanks to Leighton and Gemma who advised us throughout our sale. A great team in Cheadle and we will definitely recommend to friends and colleagues. Heaton Moor - 20/04/2015. Was very pleased with the extra effort staff went to especially by Jamie. Wilmslow - 20/04/2015. I used the Wilmslow sales office. This was a difficult sale to organise (from Herefordshire) and the team were brilliant, especially Markus and Lucy. Stockton Heath Lettings - 20/4/2015. Can’t find fault. Richard was extremely helpful and answered all queries promptly and with a professional attitude. Altrincham - 16/04/2015. We were particularly impressed with the professionalism and helpfulness of Sinead, Tom and Adam. Many thanks to them for helping us buy and sell our house. Altrincham Lettings - 2/04/2015. We have used Gascoigne Halman in Altrincham for a number of years to let our property. 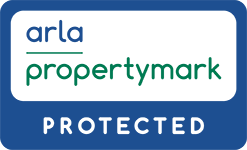 Everyone we have dealt with has been very friendly, helpful and efficient, from advising on what we could let for to finding tenants and keeping us updated. The Wimslow property management office is also very good. Overall, very happy with their service and would highly recommend. Stockton Heath Lettings - 2/04/2015. Both Richard and Andrew are a very good team and a great asset. Cheadle - 2/04/2015. Gemma and Katy at Cheadle were very helpful through what is a stressful period. Bramhall Lettings - 02/04/2015. Excellent customer service from Aimée and Moharram. Extremely impressed by their professionalism, expert advice and support. Their service surpassed my expectations. They are both an absolute credit to the company. Wilmslow - 26/03/2015. Carol – Lovely lady, very professional, knowledgeable and encouraging. Lewis – professional, helpful with great customer service and fair to both parties. Macclesfield - 26/03/2015. Carly in the Macclesfield branch was efficient and professional. Made selling my property hassle free. Definitely recommend your services to others. Wilmslow - 26/03/2015. The service I received on my sale and purchase was excellent. Markus and Lucy were so easy and lovely to deal with – Thank you. Holmes Chapel - 26/03/2015. Sarah Lawrence was out contact throughout and very impressed with her. Couldn’t have been more helpful or efficient. Bramhall - 26/03/2015. When speaking to staff and visiting your office I always found the staff friendly and professional. I would particularly mention Abigail who was our first contact with Gascoigne Halman and felt she was very professional. Also James who kept us up to date with regular phone calls. Prestbury - 26/03/2015. All Prestbury staff were great but James who was our main contact was brilliant at helping us through this process and cannot thank him enough. Holmes Chapel - 26/03/2015. We were in a long chain and things did not go smoothly but Sarah kept us well informed, answered all our queries and did her best to keep the purchase moving, chasing solicitors and other estate agents for us. 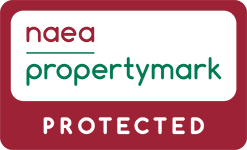 Cheadle Lettings - 26/03/2015. A huge thank you to Gemma who was so efficient and friendly and made the whole process so easy. Heaton Moor - 26/03/2015. We only dealt with Jamie who proved to be a very capable and dynamic person who we could deal with. His initial contact discussion met all our expectations and we felt he was the person to use for our property sale. He respected the ongoing situation where the property owner was very poorly and passed away within the sale period and managed all the issues raised most satisfactorily. Poynton - 20/3/2015. The initial valuation was carried out by Dan at the house , he turned up 5 minutes early and gave a valuation higher than the other agents we approached , so i told him to carry on , within a day i had an offer of the asking price . After this all contact with the branch was with Joanne she again was very helpfull and efficient . I would certainly use the branch again , and as a first choice . Poynton - 17/03/2015. We recently purchased our first house through Gascoigne Halman in Poynton. They were fantastic in helping us through the process and explaining the steps to us. They answered any queries we had and couldn't do enough to help us out. I would recommend them to any buyer or seller in the Poynton area. Branch Manager Matthew is very nice and very professional. I dealt with James on a daily basis. He was fantastic! Nothing was too much trouble. He advised us well regarding what offer to accept on our property. He was then very pro active chasing up the buyer and both solicitors. All in all a very positive experience from start to finish. Cheadle - 6/03/2015. Gemma is a star – We mainly dealt with her, but her colleagues were always helpful to 10/10. Thank you. Cheadle - 6/03/2015. I would especially highlight the great service and support we received from both Leighton Snow and Katy Bowden. Wilmslow - 6/03/2015. James Mosedale and Lewis Hughes were excellent to deal with. It was a difficult chain and they kept negotiations going (especially James who was the main contact) without which I think it would have stalled. Cheadle - 6/03/2015. Gemma was particularly helpful, providing excellent customer service, going above and beyond in order to progress the sale of my property e.g Contacting awkward solicitors to provide solutions to move things along more quickly. Cheadle - 6/03/2015. Very satisfied with Gascoigne Halman. Professional level very high. Gemma and her support staff are excellent. Altrincham Lettings - 02/03/2015. We have used Gascoigne Halman for managing our let properties for many years now, the staff at the Altincham branch are excellent and Joy's expertise was the reason we chose GH over other suppliers about 10 years ago and have stayed with the company. The service they supply regarding marketting and finding new tenants and managing the chek-in and check-out service are invaluable and run without a hitch. More recently Connor has also been helping with finding tenants and the service has been very good from him. I would recommend the landlord services from Gascoigne Halman in Altirncham and the property management service based out of Wilmslow is also excellent. I feel compelled to write this as these days many folks are the first to complain but it is often the case that exceptional service goes unrecognised or is purely expected. Whilst selling my house as part of my divorce settlement, which is always emotional, i found the entire team at gascoignes knutsford simply superb. My congratulations must go to Susan Wilson, who remained unflappable through the entire process. With the beauty of a porcelain doll, professional and experienced to the core and an incredible empathy and passion for helping people, she made me feel comforted, safe and very secure through the entire process. My sale was a very long and protracted one and her soothing influence on me allowed me to understand that being a sales agent is so much more than selling houses. Susan is a real enigma, like a swan gliding serenly along, but behind the scenes she works tirelessly to get the job done. Stunning!! I couldnt leave my review without heaping enourmous thanks upon Fay Carver. Throughout the painful and protracted sale she oversaw and helped to steer us through the swirling storms of the legal wrangling, ensuring that deadlines were met, with an almost military passion, yet still demonstrating a warmth and kindness that is only equal to that of the loving bond between a mother and her son. All in all the entire team at Gascoignes in Knutsford, Richard & Gina, are simply more than a team, they are a family, and i felt very priviledged to become welcomed into the warm bosum of that family, albeit for a brief, but very loving time.